The FIRE simulations are uniquely well suited for studies of the circum-galactic medium (CGM), where the cosmological inflows and galactic winds that regulate star formation in galaxies are mediated. In particular, our simulations self-consistently generate galactic winds with a realistic multiphase structure, which is important for comparison with spectroscopic measurements of halo gas. We have just completed the first paper from the FIRE project (Faucher-Giguère et al., available on the arXiv). This first paper focuses on HI in galaxy halos at z=2-4, which includes the peak of the cosmic star formation history. In future papers, we will use the FIRE simulations to study other observational diagnostics of the CGM, including metal absorption and emission lines, and gas kinematics. Abstract: Gas inflows and outflows regulate star formation in galaxies. Probing these processes is one of the central motivations for spectroscopic measurements of the circum-galactic medium. We use high-resolution cosmological zoom-in simulations from the FIRE project to make predictions for the covering fractions of neutral hydrogen around galaxies at z=2-4. These simulations resolve the interstellar medium of galaxies and explicitly implement a comprehensive set of stellar feedback mechanisms. Our simulation sample consists of 16 main halos covering the mass range M_h~2×10^9-8×10^12 Msun at z=2, including 12 halos in the mass range M_h~10^11-10^12 Msun corresponding to Lyman break galaxies (LBGs). We process our simulations with a ray tracing method to compute the ionization state of the gas. Galactic winds increase the HI covering fractions in galaxy halos by direct ejection of cool gas from galaxies and through interactions with gas inflowing from the intergalactic medium. Our simulations predict HI covering fractions for Lyman limit systems (LLSs) consistent with measurements around z~2-2.5 LBGs; these covering fractions are a factor ~2 higher than our previous calculations without galactic winds. The fractions of HI absorbers arising in inflows and in outflows are on average ~50% but exhibit significant time variability. For our most massive halos, we find a factor ~3 deficit in the LLS covering fraction relative to what is measured around quasars at z~2, suggesting that the presence of a quasar may affect the properties of halo gas on ~100 kpc scales. The predicted covering fractions peak at M_h~10^11-10^12 Msun, near the peak of the star formation efficiency in dark matter halos. 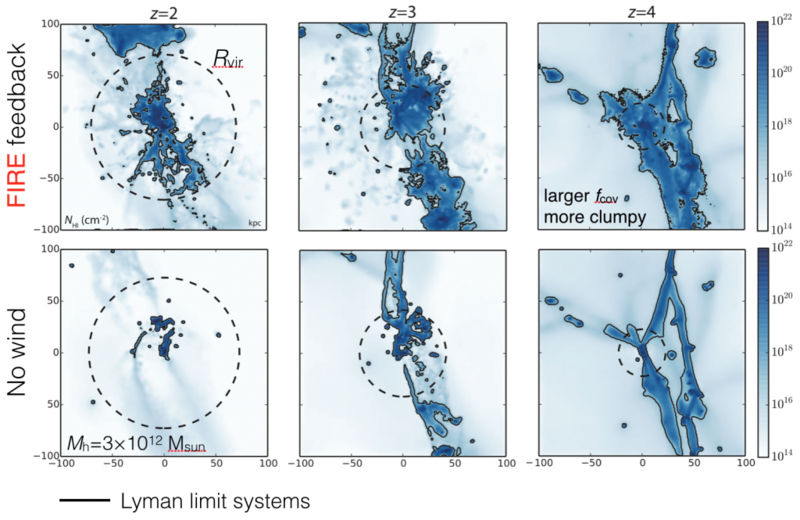 In our simulations, star formation and galactic outflows are highly time dependent; HI covering fractions are also time variable but less so because they represent averages over large areas.